Curious about car amplifiers? Do you have a car audio problem to solve or are thinking about upgrading your vehicle’s sound system? If you’ve wondered “What does a car amplifier do?” you’ve come to the right place. Car amplifiers have many great uses and benefits that go way beyond just getting loud sound in a car. They’re very helpful in a some ways you might not know about. The great news is that adding one to your vehicle can help you enjoy even better music than ever. Thanks to modern technology you can get even more value for your dollar and more installation possibilities, too. 2. What does a car amplifier do? 3. How does a car amplifier work? 4. What are channels on an amp? 7. How are car amplifiers beneficial? What does a car amplifier do? A simplified diagram showing the basic sections of a car amplifier and how it works. There’s a lot more to it, but the basics are pretty simple. A small, very low-level signal is input from a stereo and amplified to a much bigger – but identical – electrical waveform. This way it can provide lots of power and drive speakers with good volume. The +12V supply is “stepped up” (increased) to drive higher voltage to the output transistor stages. A car amplifier boosts a very small electrical audio signal to a much higher voltage capable of driving loudspeakers. Most car stereos can’t offer a high power output that can drive speakers with high volume and clarity. A great example is adding a subwoofer to your car. It takes a lot of power to get “slamming” bass! How does a car amplifier work? Car amps use a special type of internal power supply to supply their internal amplifier circuitry with a higher power. These sections then take a conditioned audio signal (provided by a stereo), boost it, and deliver it to the speaker terminals. All amps have a few basic sections that are critical for driving speakers from only a +12V source. There are also some other sections that are essential and a few that are optional. Note that #5 (speaker-level input feature) is a product-specific option and may or may not be included. However, the others are found in nearly all car amplifiers with good power sold today. I’ll explain more about speaker-level inputs as we go. 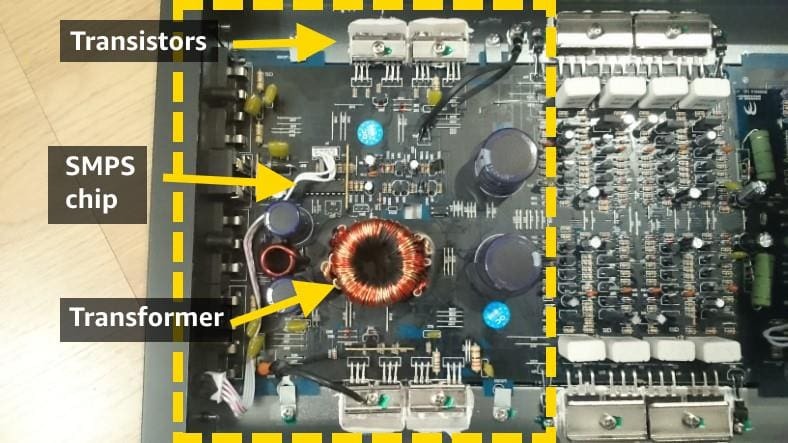 As you can see in the diagram I’ve provided, some electronic components are attached to the metal body of the amplifier. That’s because as power is delivered to speakers some is wasted and appears as heat. To help cool the high-power transistors, they’re attached to the heavy metal body of the amplifier. The illustrated main parts of a car’s switch mode power supply (SMPS). Shown here is the nice little 4 channel Crunch PD2000.4 budget amp I bought from Amazon and opened up for you. The transformer is driven by high-power transistors extremely fast (many thousands of times per second). 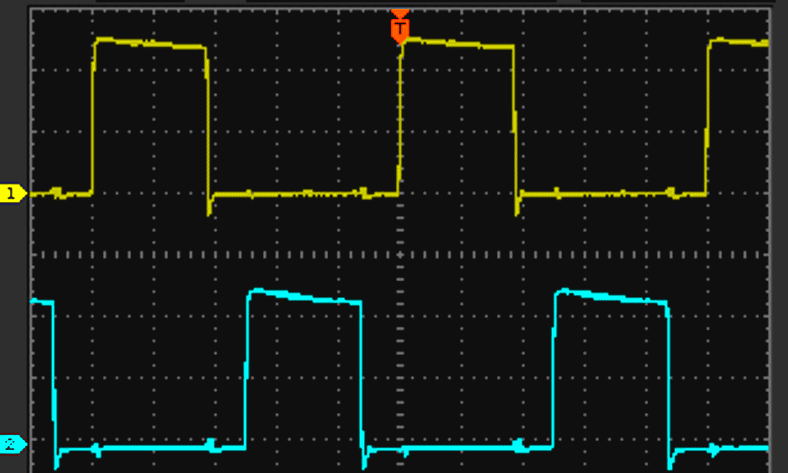 The SMPS chip controls when the transistor turn on and off rapidly according to power demands. The transformer uses magnetic fields to output a higher voltage supply on the other side from the +12V supply. Although they’re powered from the vehicle’s battery connection, it’s impossible for a car stereo or amplifier to drive speakers directly with high power from only 12 volts. The reason is because of the mathematical properties of electrical power and the speaker impedance (resistance) for speakers. Ohm’s law is a fundamental rule used to figure out things like power delivered to a load (here, a speaker) based on a certain voltage. A higher voltage can produce a higher power, just as you might have guessed by now. The same holds true for speakers in your car just as much as it does for a light bulb in your home. A car amp’s switch mode power supply (SMPS) is what makes everything else possible – it’s the most important part of the amp. It’s a critical section and necessary to get high power from only a 12V supply. DC-DC switching supplies like those in a car amp are called step-up, as they are able to take a lower voltage and multiply it several times to a higher voltage. A switching integrated circuit (IC) chip drives high-current transistors on and off thousands of times per second. They alternate cycles which enable and disable the +12V supply to the transformer. In doing so, the transformer, based on the number of turn of copper wire on it, produces higher voltages on its output. A car amp’s switching power supply turns the high-current transformer on and off rapidly thousands of times per second. Two sides of the input side (+12V input connection) are turned on and off in alternating cycles. The waveforms look like these you see here. Interestingly enough, it produces both positive and negative voltages! That’s to allow full range of polarity when an audio signal is boosted and reproduced on the output. Car amplifiers can draw a lot of electrical current. Many can easily draw up to 50A (amperes) but that’s usually only when near maximum power. During normal, low-volume use, they draw only a few amps. Amplifiers are normally connected by a fuse directly to the vehicle’s battery for the positive wire. The ground (negative) wire is normally connected to a clean metal connection on the body. This is because a vehicles original wire usually cannot handle the amount of current an amp demands under heavy use. In order to avoid having the amplifier stay on when you’re not using it, a “remote on” wire input is used. Normally this connects to a dedicated wire on you stereo. Alternatively, it can be connected to an ignition wire that turns off when the accessory position of the ignition switch is turned off. The remote wire, when at 0V, turns off power to the SMPS chip. This causes it to stop running. The amp then doesn’t draw any power from your battery. You can use a very small wire like 18 or 20 gauge, as the remote wire input of almost all amplifiers draw a tiny amount of current – often about 25 milliAmperes (.025A). Shown here are two more of the major functional sections in a car amp: the amplifier & output section and the input stages. The input stage board consists of many smaller circuits to do things like provide crossover functions, making bridging for more power possible, provide a gain control, and block ground loop noise. The amp stages take the audio signal from the input stage board, use the power supply’s output, and boost it to create a powerful output. The input stages (often grouped together, in this case on a separate printed circuit board as shown above) have a number of jobs to carry out. The input stages are made up of a type of extremely versatile electronic component called an op amp (operational amplifier). Op amps are basically little amplifier circuits built into a small chip that are used for a wide range of designs. Ground loop noise, which you may know as “alternator whine”, is a very frustrating and troublesome problem in the car stereo world. It’s an electrical noise that appears as a terrible whine which increases and decrease with the engine speed of your vehicle. This type of noise is due to electrical currents that flow within a vehicle’s body and the connections of the audio components. When there is a difference of electrical potential in 2 or more points in the system, a small voltage difference can exist. Modern car amplifiers include circuitry to virtually eliminate this in typical installations. Diagram showing how (passive) speaker crossovers like those in 2-way speaker systems work. Crossovers are a wonderful feature which can prevent potential damage to speakers. They also help prevent distortion and allow driving the speakers at higher volumes with clear sound. They’re a form of filter as they block unwanted sound from reach the speakers you’re using. Electronic crossovers in amps perform the same function but without large components like inductors and capacitors. Crossovers are a great feature provided by today’s car amps. Most sold today include electronic crossover circuitry in the front-end (input) stages of the amp. Electronic crossovers offer a low-cost, space-efficient way to send only bass or only upper-range sound to a speaker as desired. For example, when driving subwoofers, using the low-pass crossover in an amp will block everything except bass. Similarly, you can block low-end bass from smaller speakers by using the high-pass feature. This offers a way to drive speakers with much more clarity and volume that you could otherwise. As the name implies, amplifiers work by amplifying an input signal from a stereo. Because there’s no standard maximum signal voltage used by different stereos, a gain adjustment is necessary. An amplifier’s gain adjustment allows better matching the speaker output level to the input signal level. It’s also a way to reduce noise as some car stereos have good, strong output signals. In that case, an amp’s gain level can be reduced and the amp’s noise (background hiss) level will be very low. 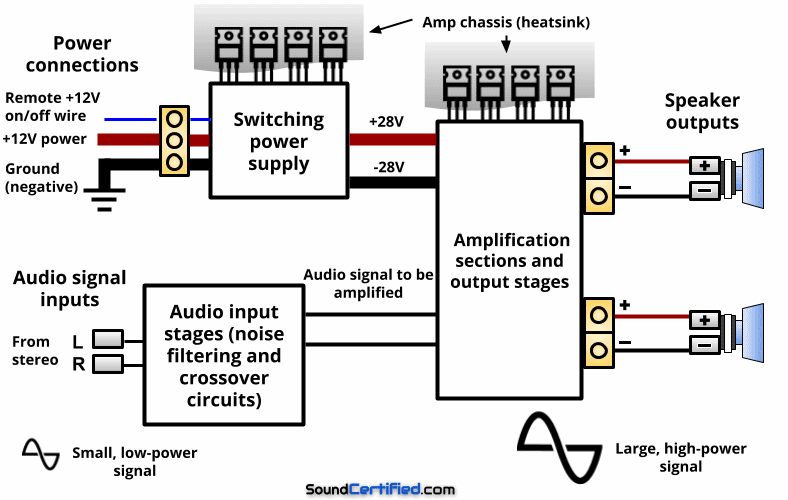 Simplified illustration of the amplification stages and output that most car amps use. A car amp has large output transistors capable of handling large amount of current. These are supplied by the switching power supply and drive the speaker. They’re controlled by some smaller components needed to split the audio signal into positive and negative halves. Car amplifiers (as seen in the earlier image I provided) have a section dedicated to driving speakers. These sections contain small components like miniature transistors and that divide the audio signal into two halves. These signals are then used to drive larger, more powerful transistors from the higher-voltage power supply’s output to the speaker. In doing so, the musical signal is amplified and the speaker is now capable of receiving a much more power signal. The speaker is driven by an identical but much larger waveform from the input signal received from a car stereo. What are channels on an amp? Channels are independent audio paths that are used to create a sound output from an amplifier. In stereo recordings, these are left and right audio sources that differ and provide left vs. right audio sound. Left and right audio channels are separate outputs from a car stereo or other source. They’re used to give fuller, more realistic sound when listening. Additionally, some stereos provide front and rear outputs pairs, although these are simply the same signals provided to drive an extra pair of speakers in the rear. In most car amps of today, amplifier channels can be “bridged.” This means that 2 channels can work together to drive one or more speakers and therefore offer more power than one channel alone. Shown: most car amplifiers have very similar connections and controls, with power connections and speaker outputs on one end. Audio inputs and gain controls are usually on the other end. This Crunch PD2000.4 4 channel amp is a good example of a typical amplifier. 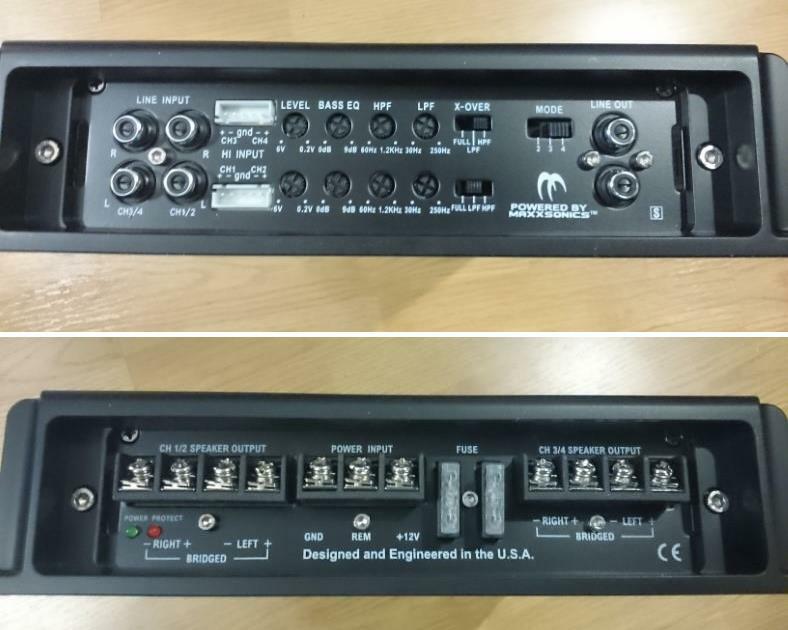 It includes speaker-level inputs (labeled as “Hi Input”, top image, white connectors). Most car amplifiers, whether expensive or budget-priced, are very similar in how they’re set up. Generally speaking power connections are wired on one end (bottom image) and RCA connectors and other controls are on the other (top image). In the top image you can see adjustable crossover dials and the switches to enable them. The point at which certain music ranges, called the cutoff frequency, is used is adjustable in this case by the user. In other models it’s a fixed setting. Power connections are typically made using larger-gauge copper wire and connectors, often included in an amp wiring kit. RCA cables are used to connect the amplifier to the audio signal outputs of the head unit from which music is played. 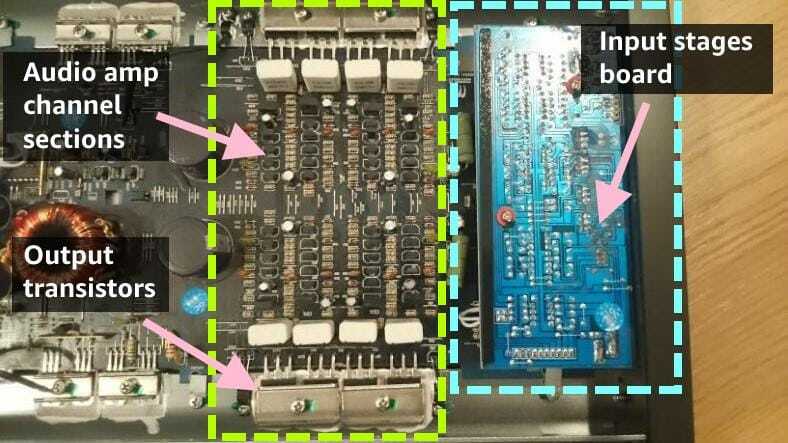 Note that in order to use to bridge 2 channels on the amp to deliver more power as 1 channel, they’re connected in a particular way. The bottom image above shows the polarity and wiring connections required. They’re marked as “Bridged” as you can see. 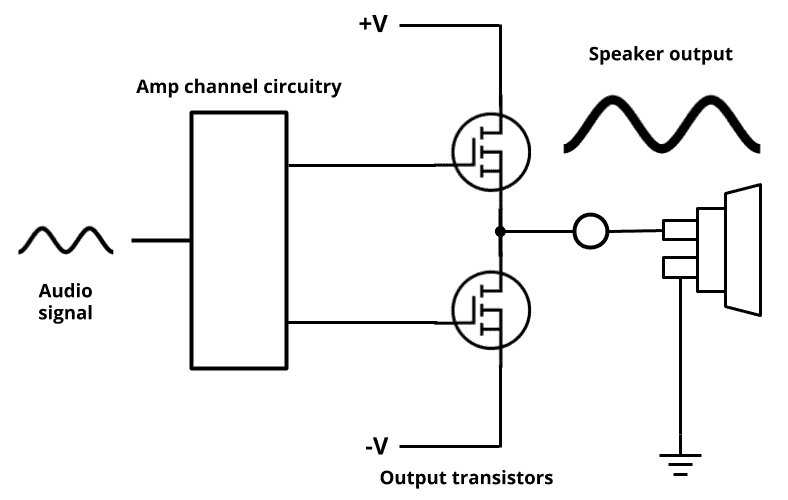 In bridged mode, one channel provides the positive speaker connection and the other provides the negative. For factory-installed stereos RCA jacks typically aren’t available. In that case speaker-level (also called “high level”) inputs, if available, can be used. These take the higher voltage speaker level signal directly from speaker wiring and reduce it to a smaller level the amplifier can use. The other option is to use a speaker-level adapter to do the same thing. A typical installation for a car amplifier. Large-gauge power wires are connected to the the power terminals and fastened using screws. Speaker wiring is connected similarly. After installation the sound system is tested and the amp’s gain control and crossovers are adjusted as needed. In order to work properly, car amplifiers must be installed with the sufficient size and type of wire. The most important reason for this is because a vehicle’s original wiring cannot handle the high-current demands of an amplifier. For example, some car amps could draw as much as 50 amps at high-volume or when driving subwoofers very hard. Factory wiring isn’t rated for these kinds of demands and a loss of voltage (and consequently, power) to the amplifier would occur. Therefore we route a sufficient power cable to the battery and ensure a good, clean electrical connection is made. A sufficiently rated fuse, held in a fuseholder, protects the positive power cable. If a problem like a short circuit occurs the fuse would blow and protect against causing a fire. Fortunately this wiring is often easily found pre-packaged and ready for use by buying an amplifier wiring kit. 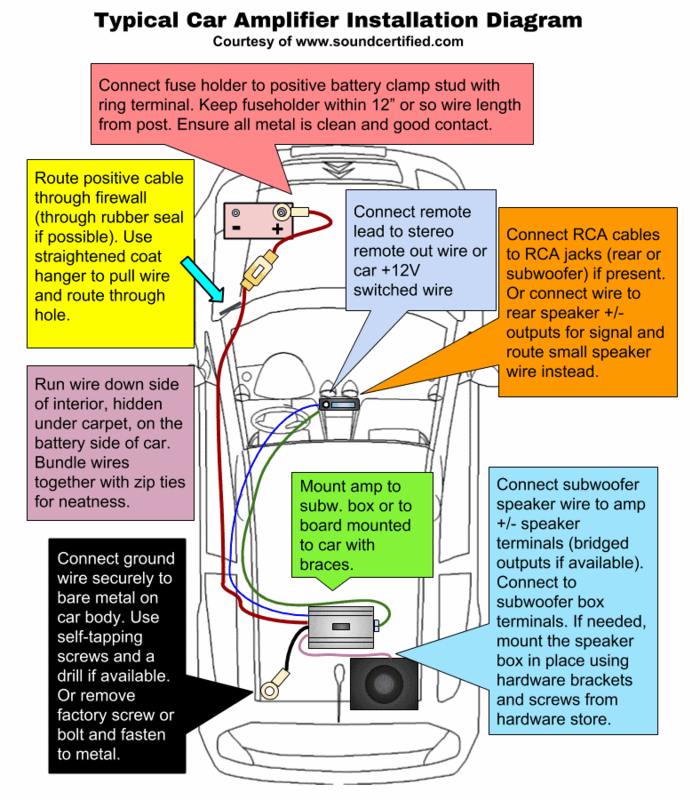 Here’s a diagram I’ve created to help better explain visually how a car amp is typically installed. Ii shows one of the most common uses of a car amplifier: adding a subwoofer for having great bass. How are car amplifiers beneficial? Today’s amplifiers can power a whole car stereo system with excellent sound and power. Some like this excellent Alpine MRV-F300 4 channel model are very compact and can be installed under a seat. A good amplifier provides several times the power an average car stereo can. Also they’re much more clear and crisp sounding. Car amplifiers have many benefits as well as being a necessity in some cases. Typical car stereos, even today, can only produce about 15 to 18 watts of power per channel at most. At higher volumes and when attempting to drive speakers that need more power, the sound from a stereo becomes distorted and terrible. Driving speakers with higher volume is basically impossible with only a car stereo. That’s where a car amplifier comes in. As I mentioned earlier, many provide features like built-in crossovers that can prevent distortion and allow you to play speakers at higher volumes with enhanced clarity. Factory systems normally cannot do this and the sound will “break up” early into higher volumes. Installing an aftermarket amplifier resolves this problem and allows more control over your audio system. Additionally, a system can easily be expanded to add a subwoofer for missing bass by either adding a 2nd amplifier or using 2 channels of a 4 channel amp to drive it. Think of 4 channel amps as an extension of a 2 channel model. They add 2 channels of speaker power but are often more compact than two separate amps. 4 channel amplifiers are nearly identical to 2 channel models. However, they do have a few differences and in some situations are more beneficial. 4 channel amplifiers are different mainly in their design: they have an additional 2 channels for adding more speakers. Most 4 channel amplifiers today also bridgeable, so they’re very flexible in how they can be used. That is to say you’re not limited to using them for only 2 or more speakers: you can use 4, 2, or even 3 channels depending upon using the bridging feature. Interested in finding some great amps that you’ll love? I’ve got a helpful buyer’s guide and some of the best amplifiers you can find here. Thinking about connecting an amp to front and rear speakers? 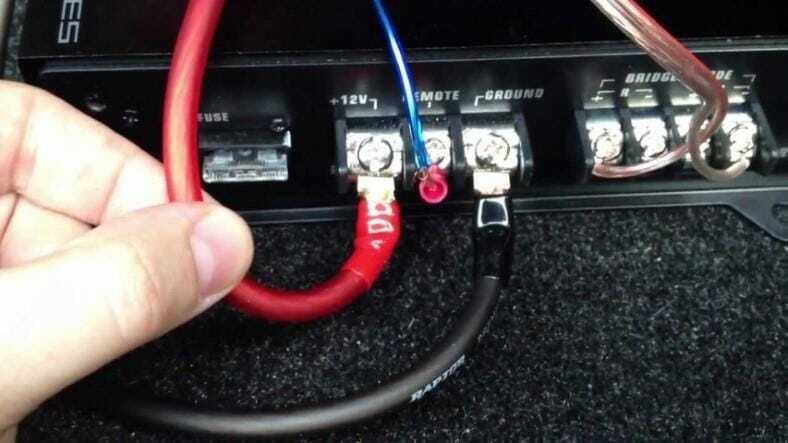 Check out my guide on how to hook up an amp to front and rear speakers. Got questions, suggestions, or comments? Let me know in the comments below or send a message. Marine Amp Vs Car Amp Differences – Can You Use A Marine Amp In Your Car Or Motorcyle? I’ve always wondered how amplifiers work. Now I know! Thanks for sharing this!